Welcome to MyDiscountEverything.COM. 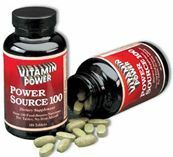 We provide more than 300 kinds of Health and Nutritional Supplements from Vitamin Power Inc. Combining the best of science and nature, Vitamin Power products provide effective nutritional support for preventative healthcare and a wide range of individual health and lifestyle needs. Established in 1975, the Vitamin Power brand is sold exclusively through independent dealers, individual retail stores and health professionals worldwide. Nutrition-conscious consumers have trusted Vitamin Power products for over 30 years to help build a solid foundation for good health and maintaining well-being. Vitamin Power products are formulated with only the finest nutritional ingredients. No unnecessary sugars, starch, salts, artificial colorings flavorings or preservatives are added. Laboratory testing assures you're getting optimum potency, purity and highest quality in every bottle. If you are not 100% satisfied with any Vitamin Power product, simply return it within 30 days of purchase for full refund or credit. All of our products are formulated, manufactured and packaged in the U.S.A. Essential Fem Balance (Healthy Fem Balance), 4 oz. Healthy Progesterone Cream, Measured Pump Bottle, 4.4 oz., 500 mg Micronized Natural USP Progesterone per oz. Advanced Retinol A Cream, 4 fl oz, 1700000 I.U. Copyright © 2005-2017 MyDiscountEverything.com. All rights reserved.